A classic French cut, to be flash fried and best served rare. Rest well before serving, perfect with buttery béarnaise and french fries. 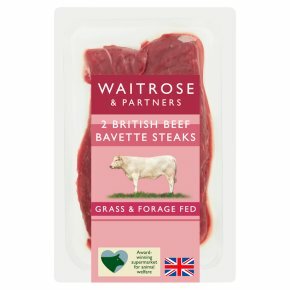 Waitrose high quality British beef is expertly prepared and matured for tenderness and flavour, our prime cattle are reared on a forage based diet on carefully selected British farms. We work with a long established group of dedicated British beef farmers, selecting them for their high standards of animal husbandry, welfare and commitment to sustainable farming. Pan Fry. RARE MEDIUM …3-4 mins 4-6 mins …Heat 1 tbsp of oil in a frying pan. Place bavette steaks into the pan, turning halfway through the cooking time. Ensure the surface of the meat is thoroughly cooked. Allow to rest in a warm place for 5 minutes before serving. BARBECUE. Take extra care when barbecuing. Cook first and barbecue to finish.